You control a submarine under attack by a squadron of helicopters. 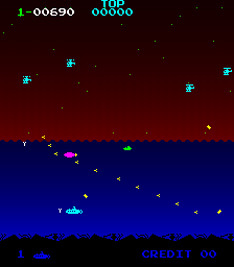 As the enemies fly overhead, they drop explosive charges into the water to try and hit you. Dodge the charges (and sealife), and return fire to stay alive. The helicopters fly in from the right, and different coloured helicopters travel at different speeds. The number of charges dropped increases as you progress. As the helicopters are always moving you must shoot slightly ahead of them to have a chance at hitting them.